Nubar Indigo Illusion. You know, for as much as I rave about Peacock Feathers, I think Indigo Illusion might be even cooler. I don't wear it as much as Peacock Feathers just because I prefer darker/vampier colors most of the time, but this is just so... so.... spellbinding. It goes from a light dusty blue (not exactly indigo, but hey, whatever) with red/pink shimmer, to purple, to green, to yellow-gold... Sometimes all at the same time. If you're a duochrome lover at all, you simply MUST see this one with your own eyes. Amazing. I think I have this and have yet to try it! What am I waiting for??? It looks incredible! I'll definitely have to check it out. This is one of my favourites, as you say, it belongs in the Trifecta of Awesome. The one and only Nubar I own! Wore it for the first like last week. AMAZING. 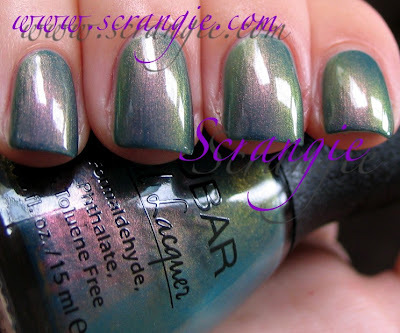 I have been loving the Nubar posts! I wish they would come up with some more, because duochromes are one of my favourite finishes. I only have three Nubar duochrome polishes... Peacock Feathers, Purple Beach and Indigo Illusion! You sure know how to create new lemmings for me! 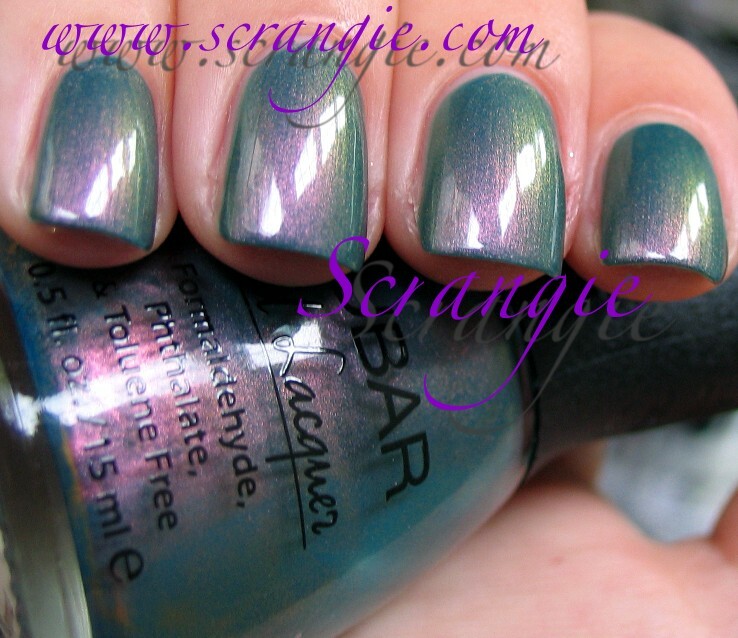 o.o I've never seen a duochrome like that before, it's gorgeous. I'd just ordered this on ebay today then seen this post! Can't wait to get it!I'd just ordered this on ebay today then seen this post! Can't wait to get it! *drools* You're right, I must see this one with my own eyes. Gorgeous pictures! I particularly love this one right now because on some turns into the light, it really reads denim blue and I am into a grayed denim blue phase right now. Nubar's duochromes are just spectacular! 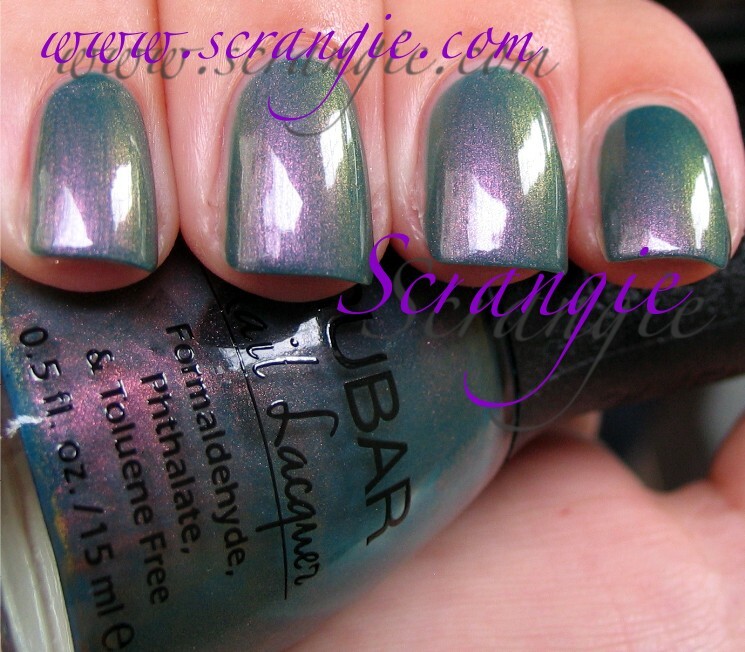 Its official...I'm making a Nubar order just to get a couple of these duochromes!!! This one is my fav so far. Just when I think I have a grip on my nail polish spending, you go and post this.just kidding. I must have this color, I can't get enough of duo chromes. Ughhh your recent posts have made me want some Nubar duochromes so badly. Amazing swatch as always, Scrangie! WOW! This is amazing. I think this is my favorite one out of all your post! I NEED THIS. I love it. But i already have so many duochromes that look similar (poor me!). Do you know if there is a dupe or something close? Can you do a comparison? My bottles of Indigo Illusion and Purple Beach are so similar. They don't look as clearly different as your photos. They're not the same, one is more blue and one more purple but I was not expecting such close colors. On the nail, they look even more similar. Is this normal? Ace, that is definitely not normal! My bottles are nothing at all like each other, not even close! Did you get your bottles directly from Nubar?